This Rust Cookbook is a collection of simple examples that demonstrate good practices to accomplish common programming tasks, using the crates of the Rust ecosystem. Read more about Rust Cookbook, including tips for how to read the book, how to use the examples, and notes on conventions. This project is intended to be easy for new Rust programmers to contribute to, and an easy way to get involved with the Rust community. It needs and welcomes help. For details see CONTRIBUTING.md. Replace all occurrences of one text pattern with another pattern. This cookbook is intended for new Rust programmers, so that they may quickly get an overview of the capabilities of the Rust crate ecosystem. It is also intended for experienced Rust programmers, who should find in the recipes an easy reminder of how to accomplish common tasks. The cookbook index contains the full list of recipes, organized into a number of sections: "basics", "encoding", "concurrency", etc. The sections themselves are more or less ordered in progression, with later sections being more advanced, and occasionally building on concepts from earlier sections. Within the index, each section contains a list of recipes. The recipes are simple statements of a task to accomplish, like "generate random numbers in a range"; and each recipe is tagged with badges indicating which crates they use, like , and which categories on crates.io those crates belong to, like . New Rust programmers should be comfortable reading from the first section to the last, and doing so should give one a strong overview of the crate ecosystem. Click on the section header in the index, or in the sidebar to navigate to the page for that section of the book. If you are simply looking for the solution to a simple task, the cookbook is today more difficult to navigate. The easiest way to find a specific recipe is to scan the index looking for the crates and categories one is interested in. From there, click on the name of the recipe to view it. This will improve in the future. Recipes are designed to give you instant access to working code, along with a full explanation of what it is doing, and to guide you to further information. All recipes in the cookbook are full, self contained programs, so that they may be copied directly into your own projects for experimentation. To do so follow the instructions below. The crate badges that accompany the examples link to the crates' full documentation on docs.rs, and is often the next documentation you should read after deciding which crate suites your purpose. Error handling in Rust is robust when done correctly, but in today's Rust it requires a fair bit of boilerplate. Because of this one often sees Rust examples filled with unwrap calls instead of proper error handling. Since these recipes are intended to be reused as-is and encourage best practices, they set up error handling correctly when there are Result types involved. The basic pattern we use is to have a fn run() -> Result that acts like the "real" main function. We use the error-chain crate to make ? work within run. // String to IP address. This is using the error_chain! macro to define a custom Error and Result type, along with automatic conversions from two standard library error types. The automatic conversions make the ? operator work. The quick_main! macro generates the actual main function and prints out the error if one occurred. For the sake of readability error handling boilerplate is hidden by default like below. In order to read full contents click on the "expand" () button located in the top right corner of the snippet. For more background on error handling in Rust, read this page of the Rust book and this blog post. This cookbook is intended eventually to provide expansive coverage of the Rust crate ecosystem, but today is limited in scope while we get it bootstrapped and work on the presentation. Hopefully, starting from a small scope and slowly expanding will help the cookbook become a high-quality resource sooner, and allow it to maintain consistent quality levels as it grows. At present the cookbook is focused on the standard library, and on "core", or "foundational", crates—those crates that make up the most common programming tasks, and that the rest of the ecosystem builds off of. The cookbook is closely tied to the Rust Libz Blitz, a project to identify, and improve the quality of such crates, and so it largely defers crate selection to that project. Any crates that have already been evaluated as part of that process are in scope for the cookbook, as are crates that are pending evaluation. Generates random numbers with help of random-number generator rand::Rng obtained via rand::thread_rng. Each thread has an initialized generator. Integers are uniformly distributed over the range of the type, and floating point numbers are uniformly distributed from 0 up to but not including 1. Generates a random value within half-open [0, 10) range (not including 10) with Rng::gen_range. Uniform can obtain values with uniform distribution. This has the same effect, but may be faster when repeatedly generating numbers in the same range. By default, random numbers have uniform distribution. To generate numbers with other distributions you instantiate a distribution, then sample from that distribution using Distribution::sample with help of a random-number generator rand::Rng. The distributions available are documented here. An example using the Normal distribution is shown below. Randomly generates a tuple (i32, bool, f64) and variable of user defined type Point. Implements the Distribution trait on type Point for Standard in order to allow random generation. Randomly generates a string of given length ASCII characters in the range A-Z, a-z, 0-9, with Alphanumeric sample. Randomly generates a string of given length ASCII characters with custom user-defined bytestring, with gen_range. This example sorts a Vector of integers via vec::sort. Alternative would be to use vec::sort_unstable which can be faster, but does not preserve the order of equal elements. A Vector of f32 or f64 can be sorted with vec::sort_by and PartialOrd::partial_cmp. Sorts a Vector of Person structs with properties name and age by its natural order (By name and age). In order to make Person sortable you need four traits Eq, PartialEq, Ord and PartialOrd. These traits can be simply derived. You can also provide a custom comparator function using a vec:sort_by method and sort only by age. This application describes the structure of its command-line interface using clap's builder style. The documentation gives two other possible ways to instantiate an application. In the builder style, with_name is the unique identifier that value_of will use to retrieve the value passed. The short and long options control the flag the user will be expected to type; short flags look like -f and long flags look like --file. Usage information is generated by clap. The usage for the example application looks like this. We can test the application by running a command like the following. Your favorite number must be 256. Decompress (GzDecoder) and extract (Archive::unpack) all files from a compressed tarball named archive.tar.gz located in the current working directory to the same location. Compress /var/log directory into archive.tar.gz. Creates a File wrapped in GzEncoder and tar::Builder. Adds contents of /var/log directory recursively into the archive under backup/logspath with Builder::append_dir_all. GzEncoder is responsible for transparently compressing the data prior to writing it into archive.tar.gz. Iterate over the Archive::entries. Use Path::strip_prefix to remove the specified path prefix (bundle/logs). Finally, extract the tar::Entry via Entry::unpack. The example uses the crossbeam crate, which provides data structures and functions for concurrent and parallel programming. Scope::spawn spawns a new scoped thread that is guaranteed to terminate before returning from the closure that passed into crossbeam::scope function, meaning that you can reference data from the calling function. This example splits the array in half and performs the work in separate threads. Declare global state using lazy_static. lazy_static creates a globally available static ref which requires a Mutex to allow mutation (also see RwLock). The Mutex wrap ensures the state cannot be simultaneously accessed by multiple threads, preventing race conditions. A MutexGuard must be acquired to read or mutate the value stored in a Mutex. This example calculates the SHA1 for every file with iso extension in the current directory. A threadpool generates threads equal to the number of cores present in the system found with num_cpus::get. Walkdir::new iterates the current directory and calls execute to perform the operations of reading and computing SHA1 hash. 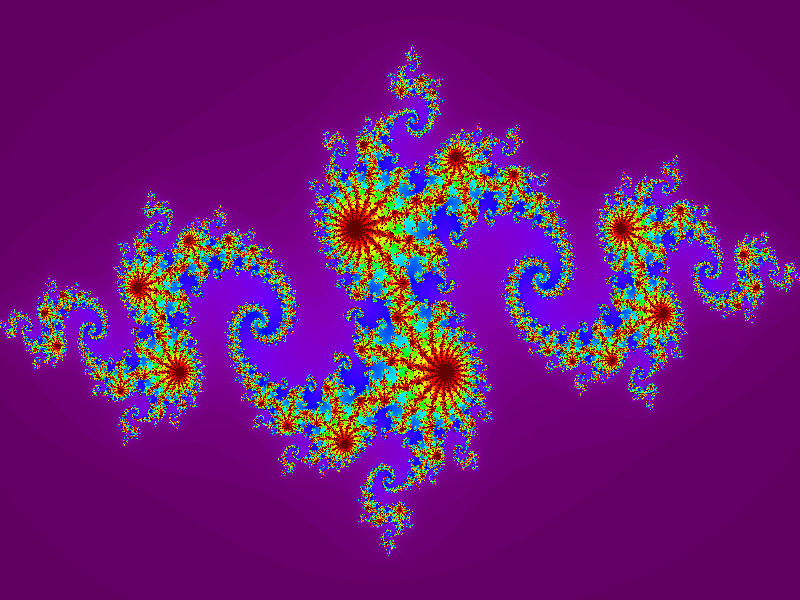 This example generates an image by drawing a fractal from the Julia set with a thread pool for distributed computation. Allocate memory for output image of given width and height with ImageBuffer::new. Rgb::from_channels calculates RGB pixel values. Create ThreadPool with thread count equal to number of cores with num_cpus::get. ThreadPool::execute receives each pixel as a separate job. mpsc::channel receives the jobs and Receiver::recv retrieves them. ImageBuffer::put_pixel uses the data to set the pixel color. ImageBuffer::save writes the image to output.png. The example uses the rayon crate, which is a data parallelism library for Rust. rayon provides the par_iter_mut method for any parallel iterable data type. This is an iterator-like chain that potentially executes in parallel. This example demonstrates using the rayon::any and rayon::all methods, which are parallelized counterparts to std::any and std::all. rayon::any checks in parallel whether any element of the iterator matches the predicate, and returns as soon as one is found. rayon::all checks in parallel whether all elements of the iterator match the predicate, and returns as soon as a non-matching element is found. This example uses rayon::find_any and par_iter to search a vector in parallel for an element satisfying the predicate in the given closure. If there are multiple elements satisfying the predicate defined in the closure argument of rayon::find_any, rayon returns the first one found, not necessarily the first one. Also note that the argument to the closure is a reference to a reference (&&x). See the discussion on std::find for additional details. This example will sort in parallel a vector of Strings. Allocate a vector of empty Strings. par_iter_mut().for_each populates random values in parallel. Although multiple options exist to sort an enumerable data type, par_sort_unstable is usually faster than stable sorting algorithms. This example uses rayon::filter, rayon::map, and rayon::reduce to calculate the average age of Person objects whose age is over 30.
rayon::filter returns elements from a collection that satisfy the given predicate. rayon::map performs an operation on every element, creating a new iteration, and rayon::reduce performs an operation given the previous reduction and the current element. Also shows use of rayon::sum, which has the same result as the reduce operation in this example. This example generates thumbnails for all .jpg files in the current directory then saves them in a new folder called thumbnails. glob::glob_with finds jpeg files in current directory. rayon resizes images in parallel using par_iter calling DynamicImage::resize. let files: Vec<_> = glob_with("*.jpg", &options)? Writes some data to a file, then calculates the SHA-256 digest::Digest of the file's contents using digest::Context. Uses ring::hmac to creates a hmac::Signature of a string then verifies the signature is correct. Uses ring::pbkdf2 to hash a salted password using the PBKDF2 key derivation function pbkdf2::derive. Verifies the hash is correct with pbkdf2::verify. The salt is generated using SecureRandom::fill, which fills the salt byte array with securely generated random numbers. Creates type safe bitfield type MyFlags with help of bitflags! macro and implements elementary clear operation as well as Display trait for it. Subsequently, shows basic bitwise operations and formatting. Use the rusqlite crate to open SQLite databases. See crate for compiling on Windows. Connection::open will create the database if it doesn't already exist. Connection::open will open the database cats created in the earlier recipe. This recipe inserts data into cat_colors and cats tables using the execute method of Connection. First, the data is inserted into the cat_colors table. After a record for a color is inserted, last_insert_rowid method of Connection is used to get id of the last color inserted. This id is used while inserting data into the cats table. Then, the select query is prepared using the prepare method which gives a statement struct. Then, query is executed using query_map method of statement. Connection::open will open the cats.db database from the top recipe. Begin a transaction with Connection::transaction. Transactions will roll back unless committed explicitly with Transaction::commit. In the following example, colors add to a table having a unique constraint on the color name. When an attempt to insert a duplicate color is made, the transaction rolls back. Use the postgres crate to create tables in a Postgres database. Connection::connect helps in connecting to an existing database. The recipe uses a URL string format with Connection::connect. It assumes an existing database named library, the username is postgres and the password is postgres. The recipe inserts data into the author table using execute method of Connection. Then, displays the data from the author table using query method of Connection. This recipe lists the nationalities of the first 7999 artists in the database of the Museum of Modern Art in descending order. Calling time::Instant::elapsed returns a time::Duration that we print at the end of the example. This method will not mutate or reset the time::Instant object. Calculates and displays the date and time two weeks from now using DateTime::checked_add_signed and the date of the day before that using DateTime::checked_sub_signed. The methods return None if the date and time cannot be calculated. Escape sequences that are available for the DateTime::format can be found at chrono::format::strftime. Gets the local time and displays it using offset::Local::now and then converts it to the UTC standard using the DateTime::from_utc struct method. A time is then converted using the offset::FixedOffset struct and the UTC time is then converted to UTC+8 and UTC-2. Gets the current UTC DateTime and its hour/minute/second via Timelike and its year/month/day/weekday via Datelike. Converts a date given by NaiveDate::from_ymd and NaiveTime::from_hms to UNIX timestamp using NaiveDateTime::timestamp. Then it calculates what was the date after one billion seconds since January 1, 1970 0:00:00 UTC, using NaiveDateTime::from_timestamp. Gets and displays the current time in UTC using Utc::now. Formats the current time in the well-known formats RFC 2822 using DateTime::to_rfc2822 and RFC 3339 using DateTime::to_rfc3339, and in a custom format using DateTime::format. Parses a DateTime struct from strings representing the well-known formats RFC 2822, RFC 3339, and a custom format, using DateTime::parse_from_rfc2822, DateTime::parse_from_rfc3339, and DateTime::parse_from_str respectively. Escape sequences that are available for the DateTime::parse_from_str can be found at chrono::format::strftime. Note that the DateTime::parse_from_str requires that such a DateTime struct must be creatable that it uniquely identifies a date and a time. For parsing dates and times without timezones use NaiveDate, NaiveTime, and NaiveDateTime. The log crate provides logging utilities. The env_logger crate configures logging via an environment variable. The debug! macro works like other std::fmt formatted strings. No output prints when running this code. By default, the log level is error, and any lower levels are dropped. Proper error handling considers exceptions exceptional. Here, an error logs to stderr with log's convenience macro error!. Creates a custom logger configuration using the Builder::target to set the target of the log output to Target::Stdout. Implements a custom logger ConsoleLogger which prints to stdout. In order to use the logging macros, ConsoleLogger implements the log::Log trait and log::set_logger installs it. Logs messages to UNIX syslog. Initializes logger backend with syslog::init. syslog::Facility records the program submitting the log entry's classification, log::LevelFilter denotes allowed log verbosity and Option<&str> holds optional application name. Creates two modules foo and nested foo::bar with logging directives controlled separately with RUST_LOG environmental variable. Sets the default log::Level to warn, module foo and module foo::bar to info and debug. Builder::parse parses MY_APP_LOG environment variable contents in the form of RUST_LOG syntax. Then, Builder::init initializes the logger. All these steps are normally done internally by env_logger::init. Creates a custom logger configuration with Builder. Each log entry calls Local::now to get the current DateTime in local timezone and uses DateTime::format with strftime::specifiers to format a timestamp used in the final log. The example calls Builder::format to set a closure which formats each message text with timestamp, Record::level and body (Record::args). log4rs configures log output to a custom location. log4rs can use either an external YAML file or a builder configuration. Create the log configuration with log4rs::append::file::FileAppender. An appender defines the logging destination. The configuration continues with encoding using a custom pattern from log4rs::encode::pattern. Assigns the configuration to log4rs::config::Config and sets the default log::LevelFilter. Parse and increment a version string. Constructs a semver::Version from a string literal using Version::parse, then increments it by patch, minor, and major version number one by one. Note that in accordance with the Semantic Versioning Specification, incrementing the minor version number resets the patch version number to 0 and incrementing the major version number resets both the minor and patch version numbers to 0. Parse a complex version string. Constructs a semver::Version from a complex version string using Version::parse. The string contains pre-release and build metadata as defined in the Semantic Versioning Specification. Note that, in accordance with the Specification, build metadata is parsed but not considered when comparing versions. In other words, two versions may be equal even if their build strings differ. Check if given version is pre-release. Given two versions, is_prerelease asserts that one is pre-release and the other is not. Given a list of version &strs, finds the latest semver::Version. semver::VersionReq filters the list with VersionReq::matches. Also demonstrates semver pre-release preferences. Runs git --version using Command, then parses the version number into a semver::Version using Version::parse. VersionReq::matches compares semver::VersionReq to the parsed version. The command output resembles "git version x.y.z". This section covers "build-time" tooling, or code that is run prior to compiling a crate's source code. Conventionally, build-time code lives in a build.rs file and is commonly referred to as a "build script". Common use cases include rust code generation and compilation of bundled C/C++/asm code. See crates.io's documentation on the matter for more information. To accommodate scenarios where additional C, C++, or assembly is required in a project, the cc crate offers a simple api for compiling bundled C/C++/asm code into static libraries (.a) that can be statically linked to by rustc. The following example has some bundled C code (src/hello.c) that will be used from rust. Before compiling rust source code, the "build" file (build.rs) specified in Cargo.toml runs. Using the cc crate, a static library file will be produced (in this case, libhello.a, see compile docs) which can then be used from rust by declaring the external function signatures in an extern block. Since the bundled C is very simple, only a single source file needs to be passed to cc::Build. For more complex build requirements, cc::Build offers a full suite of builder methods for specifying include paths and extra compiler flags. Linking a bundled C++ library is very similar to linking a bundled C library. The two core differences when compiling and statically linking a bundled C++ library are specifying a C++ compiler via the builder method cpp(true) and preventing name mangling by the C++ compiler by adding the extern "C" section at the top of our C++ source file. It is simple to build bundled C code with custom defines using cc::Build::define. The method takes an Option value, so it is possible to create defines such as #define APP_NAME "foo" as well as #define WELCOME (pass None as the value for a value-less define). This example builds a bundled C file with dynamic defines set in build.rs and prints "Welcome to foo - version 1.0.2" when run. Cargo sets some environment variables which may be useful for some custom defines. Encode an input string with percent-encoding using the utf8_percent_encode function from the url crate. Then decode using the percent_decode function. The encode set defines which bytes (in addition to non-ASCII and controls) need to be percent-encoded. The choice of this set depends on context. For example, url encodes ? in a URL path but not in a query string. The return value of encoding is an iterator of &str slices which collect into a String. Encodes a string into application/x-www-form-urlencoded syntax using the form_urlencoded::byte_serialize and subsequently decodes it with form_urlencoded::parse. Both functions return iterators that collect into a String. The data_encoding crate provides a HEXUPPER::encode method which takes a &[u8] and returns a String containing the hexadecimal representation of the data. Similarly, a HEXUPPER::decode method is provided which takes a &[u8] and returns a Vec<u8> if the input data is successfully decoded. The example below coverts &[u8] data to hexadecimal equivalent. Compares this value to the expected value. Encodes byte slice into base64 String using encode and decodes it with decode. Reads standard CSV records into csv::StringRecord — a weakly typed data representation which expects valid UTF-8 rows. Alternatively, csv::ByteRecord makes no assumptions about UTF-8. Serde deserializes data into strongly type structures. See the csv::Reader::deserialize method. Reads CSV records with a tab delimiter. Returns only the rows from data with a field that matches query. Disclaimer: this example has been adapted from the csv crate tutorial. CSV files often contain invalid data. For these cases, the csv crate provides a custom deserializer, csv::invalid_option, which automatically converts invalid data to None values. This example shows how to serialize a Rust tuple. csv::writer supports automatic serialization from Rust types into CSV records. write_record writes a simple record containing string data only. Data with more complex values such as numbers, floats, and options use serialize. Since CSV writer uses internal buffer, always explicitly flush when done. The following example shows how to serialize custom structs as CSV records using the serde crate. Transform a CSV file containing a color name and a hex color into one with a color name and an rgb color. Utilizes the csv crate to read and write the csv file, and serde to deserialize and serialize the rows to and from bytes. The serde_json crate provides a from_str function to parse a &str of JSON. Unstructured JSON can be parsed into a universal serde_json::Value type that is able to represent any valid JSON data. The example below shows a &str of JSON being parsed. The expected value is declared using the json! macro. Parse some TOML into a universal toml::Value that is able to represent any valid TOML data. Parse TOML into your own structs using Serde. byteorder can reverse the significant bytes of structured data. This may be necessary when receiving information over the network, such that bytes received are from another system. Handles error that occur when trying to open a file that does not exist. It is achieved by using error-chain, a library that takes care of a lot of boilerplate code needed in order to handle errors in Rust. Io(std::io::Error) inside foreign_links allows automatic conversion from std::io::Error into error_chain! defined type implementing the Error trait. The below recipe will tell how long the system has been running by opening the Unix file /proc/uptime and parse the content to get the first number. Returns uptime unless there is an error. Other recipes in this book will hide the error-chain boilerplate, and can be seen by expanding the code with the ⤢ button. The error-chain crate makes matching on different error types returned by a function possible and relatively compact. ErrorKind determines the error type. Uses reqwest to query a random integer generator web service. Converts the string response into an integer. The Rust standard library, reqwest, and the web service can all generate errors. Well defined Rust errors use foreign_links. An additional ErrorKind variant for the web service error uses errors block of the error_chain! macro. This recipe shows how to handle a complex error scenario and then print a backtrace. It relies on chain_err to extend errors by appending new errors. The error stack can be unwound, thus providing a better context to understand why an error was raised. The below recipes attempts to deserialize the value 256 into a u8. An error will bubble up from Serde then csv and finally up to the user code. .ok_or("Cannot deserialize the first CSV record")? Run the recipe with RUST_BACKTRACE=1 to display a detailed backtrace associated with this error. Writes a three-line message to a file, then reads it back a line at a time with the Lines iterator created by BufRead::lines. File implements Read which provides BufReader trait. File::create opens a File for writing, File::open for reading. Use same_file::Handle to a file that can be tested for equality with other handles. In this example, the handles of file to be read from and to be written to are tested for equality. displays the contents of the file new.txt. errors because the two files are same. Creates a memory map of a file using memmap and simulates some non-sequential reads from the file. Using a memory map means you just index into a slice rather than dealing with seek to navigate a File. The Mmap::map function assumes the file behind the memory map is not being modified at the same time by another process or else a race condition occurs. Gets the current working directory by calling env::current_dir, then for each entries in fs::read_dir, extracts the DirEntry::path and gets the metadata via fs::Metadata. The Metadata::modified returns the SystemTime::elapsed time since last modification. Duration::as_secs converts the time to seconds and compared with 24 hours (24 * 60 * 60 seconds). Metadata::is_file filters out directories. The following would assert that a loop exists. Find recursively in the current directory duplicate filenames, printing them only once. Find JSON files modified within the last day in the current directory. Using follow_links ensures symbolic links are followed like they were normal directories and files. Uses filter_entry to descend recursively into entries passing the is_not_hidden predicate thus skipping hidden files and directories. Iterator::filter applies to each WalkDir::DirEntry even if the parent is a hidden directory. Root dir "." yields through WalkDir::depth usage in is_not_hidden predicate. Recursion depth can be flexibly set by WalkDir::min_depth & WalkDir::max_depth methods. Calculates sum of all file sizes to 3 subfolders depth, ignoring files in the root folder. Recursively find all PNG files in the current directory. In this case, the ** pattern matches the current directory and all subdirectories. Use the ** pattern in any path portion. For example, /media/**/*.png matches all PNGs in media and it's subdirectories. Find all files with given pattern ignoring filename case. Find all image files in the /media/ directory matching the img_[0-9]*.png pattern. A custom MatchOptions struct is passed to the glob_with function making the glob pattern case insensitive while keeping the other options Default. Shows the number of logical CPU cores in current machine using [num_cpus::get]. Declares a lazily evaluated constant HashMap. The HashMap will be evaluated once and stored behind a global static reference. In this example, the port is displayed on the console, and the program will listen until a request is made. SocketAddrV4 assigns a random port when setting port to 0. Runs git log --oneline as an external Command and inspects its Output using Regex to get the hash and message of the last 5 commits. Opens the python interpreter using an external Command and passes it a python statement for execution. Output of statement is then parsed. .ok_or("Child process stdin has not been captured!")? Shows up to the 10th biggest files and subdirectories in the current working directory. It is equivalent to running: du -ah . | sort -hr | head -n 10. Commands represent a process. Output of a child process is captured with a Stdio::piped between parent and child. Spawns a child process and redirects stdout and stderr to the same file. It follows the same idea as run piped external commands, however process::Stdio writes to a specified file. File::try_clone references the same file handle for stdout and stderr. It will ensure that both handles write with the same cursor position. The below recipe is equivalent to run the Unix shell command ls . oops >out.txt 2>&1. In Run an external command and process stdout, processing doesn't start until external Command is finished. The recipe below calls Stdio::piped to create a pipe, and reads stdout continuously as soon as the BufReader is updated. The below recipe is equivalent to the Unix shell command journalctl | grep usb. The ndarray crate supports a number of ways to create arrays -- this recipe focuses on creating ndarray::Arrays from std::Vec via from_vec. Adding two arrays together is no different than adding two numbers together. Using the & operand on the arrays within an arithmetic operation prevents the operation from consuming the arrays. Without &, the arrays are consumed. In the first example, arrays a and b are moved in the let-statement z = a + b. In the second example, the arrays c and d are not moved and instead, a new array is created for w. Updating either of c or d after the vector sum has no effect the value of w. Additionally, while printing c works as expected, it would be an error to print b due to the move. See Binary Operators With Two Arrays for additional detail. Note that both l1_norm and l2_norm take the ArrayView1 type. This recipe considers vector norms, so the norm functions only need to accept one dimensional views (hence ArrayView1). While the functions could take a parameter of type &Array1<f64> instead, that would require the caller to have a reference to an owned array, which is more restrictive than just having access to a view (since a view can be created from any array or view, not just an owned array). The most convenient argument type for the caller would be &ArrayBase<S, Ix1> where S: Data, because then the caller could use &array or &view instead of x.view(). If the function is part of your public API, that may be a better choice for the benefit of your users, but for internal functions, the more concise ArrayView1<f64> may be preferable. Creates two matrices with ndarray::arr2 and adds them together. Creates two matrices with ndarray::arr2 and performs matrix multiplication on them with ndarray::ArrayBase::dot. Creates a 1-D array (vector) with ndarray::arr1 and a 2-D array (matrix) with ndarray::arr2. First, a scalar is multiplied by the vector to get another vector. Then, the matrix is multiplied by the new vector with ndarray::Array2::dot. (dot performs matrix multiplication, while the * operator performs element-wise multiplication.) In ndarray, 1-D arrays can be interpreted as either row or column vectors depending on context. If representing the orientation of a vector is important, a 2-D array with one row or one column must be used instead. In this example, the vector is a 1-D array on the right-hand side, so dot handles it as a column vector. Creates a 3x3 matrix with nalgebra::Matrix3 and inverts it, if possible. Creates complex numbers of type num::complex::Complex. Both the real and imaginary part of the complex number must be of the same type. Performing mathematical operations on complex numbers is the same as on built in types: the numbers in question must be of the same type (i.e. floats or integers). Complex numbers have a range of interesting properties when it comes to how they interact with other mathematical functions, most notibly the family of sine functions as well as the number e. To use these functions with complex numbers, the Complex type has a few built in functions, all of which can be found here: num::complex::Complex. These examples calculate measures of central tendency for a data set contained within a Rust array. There may be no mean, median or mode to calculate for an empty set of data, so each function returns an [Option] to be handled by the caller. The first example calculates the mean (the sum of all measurements divided by the number of measurements in the set) by producing an iterator of references over the data, and using [sum] and [len] to determine the total value and count of values respectively. The second example calculates the median using the quickselect algorithm, which avoids a full [sort] by sorting only partitions of the data set known to possibly contain the median. This uses [cmp] and [Ordering] to succinctly decide the next partition to examine, and [split_at] to choose an arbitrary pivot for the next partition at each step. The final example calculates the mode using a mutable [HashMap] to collect counts of each distinct integer from the set, using a [fold] and the [entry] API. The most frequent value in the [HashMap] surfaces with [max_by_key]. This example calculates the standard deviation and z-score of a set of measurements. The standard deviation is defined as the square root of the variance (here calculated with f32's [sqrt], where the variance is the [sum] of the squared difference between each measurement and the [mean], divided by the number of measurements. The z-score is the number of standard deviations a single measurement spans away from the [mean] of the data set. Calculation for integers exceeding 128 bits are possible with BigInt. Validates that an email address is formatted correctly, and extracts everything before the @ symbol. Extracts, sorts, and deduplicates list of hashtags from text. The hashtag regex given here only catches Latin hashtags that start with a letter. The complete twitter hashtag regex is much more complicated. Processes a string of text using Regex::captures_iter to capture multiple phone numbers. The example here is for US convention phone numbers. Reads a file named application.log and only outputs the lines containing “version X.X.X”, some IP address followed by port 443 (e.g. “192.168.0.1:443”), or a specific warning. A regex::RegexSetBuilder composes a regex::RegexSet. Since backslashes are very common in regular expressions, using raw string literals makes them more readable. Replaces all occurrences of the standard ISO 8601 YYYY-MM-DD date pattern with the equivalent American English date with slashes. For example 2013-01-15 becomes 01/15/2013. The method Regex::replace_all replaces all occurrences of the whole regex. &str implements the Replacer trait which allows variables like $abcde to refer to corresponding named capture groups (?P<abcde>REGEX) from the search regex. See the replacement string syntax for examples and escaping detail. Collect individual Unicode graphemes from UTF-8 string using the UnicodeSegmentation::graphemes function from the unicode-segmentation crate. Creates a custom struct RGB and implements the FromStr trait to convert a provided color hex code into its RGB color code. Use reqwest::get to perform a HTTP GET request and then use Document::from_read to parse the response into a HTML document. find with the criteria of Name is "a" retrieves all links. Call filter_map on the Selection retrieves URLs from links that have the "href" attr (attribute). Call get_base_url to retrieve the base URL. If the document has a base tag, get the href attr from base tag. Position::BeforePath of the original URL acts as a default. Iterate through links in the document and parse with url::ParseOptions and Url::parse). Makes a request to the links with reqwest and verifies StatusCode. Pull the source of a MediaWiki page using reqwest::get and then look for all entries of internal and external links with Regex::captures_iter. Using Cow avoids excessive String allocations. MediaWiki link syntax is described here. The parse method from the url crate validates and parses a &str into a Url struct. The input string may be malformed so this method returns Result<Url, ParseError>. Once the URL has been parsed, it can be used with all of the methods in the Url type. A base URL includes a protocol and a domain. Base URLs have no folders, files or query strings. Each of those items are stripped out of the given URL. PathSegmentsMut::clear removes paths and Url::set_query removes query string. The join method creates a new URL from a base and relative path. The Url struct exposes various methods to extract information about the URL it represents. origin produces the same result. Parses Url and slices it with url::Position to strip unneeded URL parts. The following example shows how to parse a MIME type from a string using the mime crate. FromStrError produces a default MIME type in an unwrap_or clause. The following example shows how to return the correct MIME type from a given filename using the mime crate. The program will check for file extensions and match against a known list. The return value is mime:Mime. When receiving a HTTP reponse from reqwest the MIME type or media type may be found in the Content-Type header. reqwest::header::HeaderMap::get retrieves the header as a reqwest::header::HeaderValue, which can be converted to a string. The mime crate can then parse that, yielding a mime::Mime value. The mime crate also defines some commonly used MIME types. Note that the reqwest::header module is exported from the http crate. Parses the supplied URL and makes a synchronous HTTP GET request with reqwest::get. Prints obtained reqwest::Response status and headers. Reads HTTP response body into an allocated String using read_to_string. Queries GitHub stargazers API v3 with reqwest::get to get list of all users who have marked a GitHub project with a star. reqwest::Response is deserialized with Response::json into User objects implementing serde::Deserialize. Query the GitHub Users Endpoint using a HEAD request (Client::head) and then inspect the response code to determine success. This is a quick way to query a rest resource without needing to receive a body. reqwest::Client cofigured with ClientBuilder::timeout ensures a request will not last longer than a timeout. Creates a gist with POST request to GitHub gists API v3 using Client::post and removes it with DELETE request using Client::delete. The reqwest::Client is responsible for details of both requests including URL, body and authentication. The POST body from serde_json::json! macro provides arbitrary JSON body. Call to RequestBuilder::json sets the request body. RequestBuilder::basic_auth handles authentication. The call to RequestBuilder::send synchronously executes the requests. The example uses HTTP Basic Auth in order to authorize access to GitHub API. Typical use case would employ one of the much more complex OAuth authorization flows. Wraps a paginated web API in a convenient Rust iterator. The iterator lazily fetches the next page of results from the remote server as it arrives at the end of each page. Creates a temporary directory with TempDir::new and synchronously downloads a file over HTTP using reqwest::get. Creates a target File with name obtained from Response::url within TempDir::path and copies downloaded data into it with io::copy. The temporary directory is automatically removed on run function return. reqwest::Client establishes a connection to https://paste.rs following the reqwest::RequestBuilder pattern. Calling Client::post with a URL establishes the destination, RequestBuilder::body sets the content to send by reading the file, and RequestBuilder::send blocks until the file uploads and the response returns. read_to_string returns the response and displays in the console. Uses reqwest::Client::head to get the Content-Length of the response. The code then uses reqwest::Client::get to download the content in chunks of 10240 bytes, while printing progress messages. The Range header specifies the chunk size and position. The Range header is defined in RFC7233. #             // values are integers, that can't happen.